[2013-2014 (just a regular froyo now)] Ahhhh Hood Ice Cream. You may remember that when I first started this blog, I use to keep a box of their ice cream sandwiches in the freezer at work. 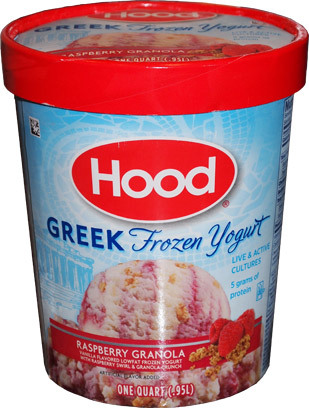 I can't tell you how many times I've gone to the grocery store and seen a couple or a family debating which Hood flavor they are going to pick up this week. Hood is an integral part of New England culture and they've decided to take the popular tactic of jumping into the greek froyo game. There are four new flavors, they come in a quart, and this is the one that really got my attention. 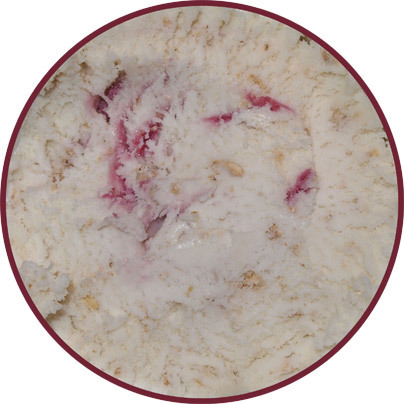 It's the Raspberry Granola flavor which is vanilla flavored low fat frozen yogurt with raspberry swirl & granola crunch. 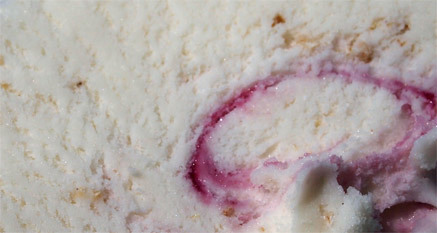 We've got the creativeness of a Ben & Jerry's flavor but in a low fat form. I can't resist and I do the greek froyo smell test. I take my first bite... and it's not bad, not bad at all. I take a few more and there's something going on here that's got my attention. There might be a greek tang here somewhere, but all I taste is a real mild raspberry bite. Eh, not even a bite, just a note really. I've tried a lot of different takes on greek frozen yogurt yet this one is setting itself apart for me. You can see from the picture that it's very airy, and in fact it does kind of have a bit of icy/watery feel to it, but that's okay! You see, It's like the animation rule in movies (wiki Uncanny Valley). There is this no man's land where something isn't good enough to be ice cream, but it's not different enough so that you know it's not ice cream. There's no mistaking this for an ice cream, but that's a good thing. Yeah, I just lost everyone didn't I? See, the pleasant flavor profile mixed with the very light texture makes for a nice healthy snack. 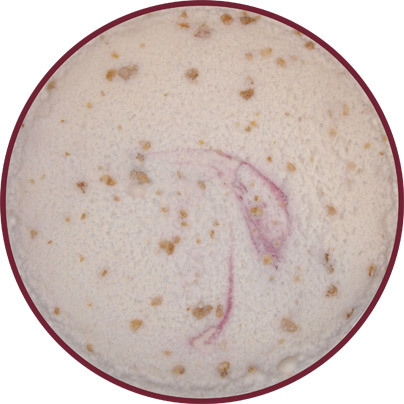 It's this nice light vanilla flavor with hints of raspberry and dotted with lovely little granola nuggets. It doesn't feel slimy or rubbery or tart or fake. It's just clean and nice. You know, I would never had guessed this is greek froyo, it's just that different. I'm not even really sure what to compare it to. I guess it kind of reminds me of blue bunny's take on froyo before they reformulated.... hehehe, just got a ton of granola in that bite. Sure, I had been expecting a strong raspberry flavoring, but again, that's ok. This feels like a very light snack, no guilt, and lots of protein. I really like the underlying vanilla flavor that ties everything together. You know what, I think my bowl needs a refill. On Second Scoop: Ok, not only did I refill my bowl this afternoon, but I had some of this after dinner as well. It's just a real nice light treat, I really need to stress that. They really did a nice job balancing the flavor profile to keep it in tune with the texture. Oh, and I'm a sucker for granola. Nice job Hood, I'll totally be mixing this into the rotation as my no guilt snack. Final Shot: Now I purchased the raspberry flavor reviewed today, but Hood did a media event on Tuesday that I regrettably missed. I sent over my apologies for the last minute cancellation and their PR folks responded by sending over a delivery of the other three flavors. 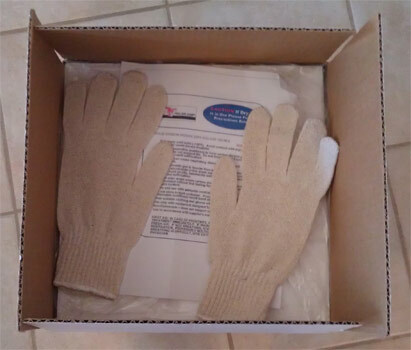 Big thanks to them for the free samples and even bigger thanks for being the first company to send my a pair of gloves so I don't hurt myself. My ice cream spoon beats your gloves.